It added new points of views to my understanding about humankind. Starts out as an impressive, factual read but as it progresses unto more modern times the author can't resist interjecting biased views. If you are looking for new insights on the development of our species and are not afraid to have your old perceptions challenged, then this is a brilliant tome. As a previous critic wrote, everyone's ox get gored here. Great details and good fun and fodder for the open mind! This book is so chock full of facts and insights that I have to listen to it again. It is brilliant and informative. Great read. This is a perfect read to follow up Jered Diamond's books. Homo Deus is sold separately but imo they are 2 halves of the same great book. If an alien from another planet stopped by, studied earth and reported on what he found to his fellows he would likely produce something quite similar to this book. 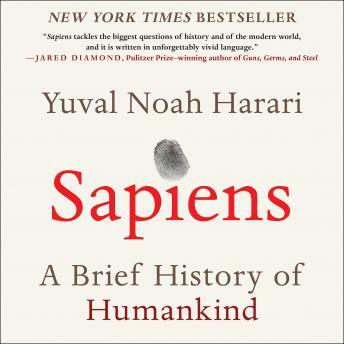 If you want an objective view of sapiens and the how and why of our rise to prominence this is the book for you. If you are easily offended, especially when your particular "ox" or belief system is gored then either brace yourself or avoid this book entirely. I found the subject material fascinating and although I disagreed with some of his points, enlightening. I highly recommend this book. I listened to the book very attentively until after I listened to the author's critique of the American Consitution. Mr. Harari stresses the importance of rationality as the benchmark for understanding the evolution of thinking. Mr. Harari chooses the American Constitution as a topic of discussion and alleges the lack of fairness in face of the institution of slavery when it was enacted; Mr. Harari treatment of the topic comes short of examining the Founding Fathers personal positions regarding the institution, therefore, it is dishonest and discredits his work. Mr. Harari chooses to inject the concept of fairness, which he rejected as not relevant to his work, on this particular instance of Human History, a very personal perspective on a very broad topic, to insidiously condemn the most influential political experiment in Human history. After reflecting on it for a few days I choose to stop listening to the book. How could I have trusted the author to have been honest afterward?